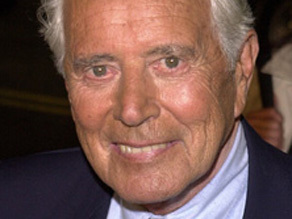 (CNN) - Actor John Forsythe has died at the age of 92, his publicist said Friday. He died Thursday in Santa Ynez, California, from complications from pneumonia after a year-long struggle with cancer, according to a statement from his publicist. "Thankfully, he died as he lived his life - with dignity and grace," the statement said. Forsythe was perhaps best known as the voice of the never-seen Charlie in the TV show and movies "Charlie's Angels," and for his role as oil magnate Blake Carrington in the 1980s TV show "Dynasty," for which he received two Golden Globe Awards for best actor. He is survived by his wife, three children, six grandchildren, and five great-grandchildren, the statement said. Forsythe, the son of a Wall Street businessman, was born John Lincoln Freund in 1918 in Penn's Grove, New Jersey. After attending the University of North Carolina, he moved to New York City, where he began his career as a radio actor. He also worked as the field announcer for the Brooklyn Dodgers at Ebbets Field. I guess that's the end of Charlies Angels? RIP John Forsythe, you had one of the greatest job's in Hollywood, record your voice on your time, mix with your fellow celebs and collect a massive amount of wealth and fortune. Will always remember him in Dynasty. Thank you for all the shows you have given us and rest in peace. Condolences. John Forsythe was a real class act; never a negative comment about him nor a negative action or comment from him. RIP John Forsythe. May you rest in peace. I spend my teen years watching Dynasty. Helluva good fun. Loved him on Dynasty as Blake Carrington, and his voice as Charlie for Charlie's Angeles. Very classy man. May he RIP.